With an adjustable release value of up to 16, the Beast offers a level of security that positions it among the best big-mountain bindings in the world. The heel and toe release mechanisms are perfectly complemented, so you get a smooth, predictable release every time. Machined metal internals and burly construction make this binding rigid and monstrously tough. At just 935 grams per binding, this is one of the lightest touring bindings boast a release value of up to 16. Step into the Beast and spring-loaded pins swing in to secure the toe while heel pins and a pair of boot-bail fangs secure the heel. Even if your release value is high, the binding entry force stays low, so you never struggle in deep snow. Dynafit broke the mold with this heelpiece design. It adjusts to accommodate a range of boot-sole lengths, featuring a four-point retention system, a low entry force, compatible with brakes up to 135mm wide on any release value setting. Heel to Toe, the Beast 16 is Tech-compatible only. Traditional Dynafit pins secure the heel and toe, and two fangs provide added security at the heel bail. You get a smooth, efficient stride for ascending and improved security for descending. Balanced binding elasticity is key to safety, and the design of the Beast offers more elasticity than any other Dynafit binding. Much like an alpine binding, the Beast allows the boot, binding, and ski to flex together for a smoother ride. A toe lever and heel riser switch this binding from ski to tour mode—without requiring you to step out of the binding. With a low ramp angle, a two-stage climbing riser, and little-to-no lifted weight underfoot, you can ascend with speed and power. This is the first Dynafit binding to feature a pivoting toe piece. With up to 12 degrees of rotation and a mechanism to re-center the toe, this technology improves the safety of this one-of-a-kind Tech binding. 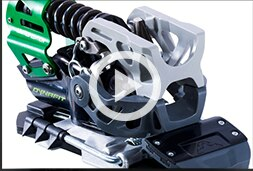 Many alpine touring bindings use a frame that forces you to lift the weight of the heelpiece with every stride. With the Beast’s frameless design, there’s no lifted weight—you simply pivot at the toe and glide. An extra-wide binding footprint gives you precise control and improved power transmission to the ski, and both the heel and toepieces mount low and close to the ski to maximize the feeling of responsiveness underfoot. After three decades of success with its traditional binding designs, Dynafit turned to athlete/designer Frederick Andersson and big-mountain skier Eric Hjorleifson to create something new. Driven by an industry push toward wide skis, stiff boots, and aggressive backcountry skiing, it wasn’t long before the pair recognized that a burly, Tech-compatible (TLT) touring binding was the answer. Frederick created and refined the Beast 16, and Hoji pushed the design it to its limits—and thus, the Beast was born. The Beast forges into new territory for a Tech-compatible (TLT) binding. Dynafit’s engineers took a look at existing technologies, decided it was time for something new, and went about inventing technologies to suit their need. 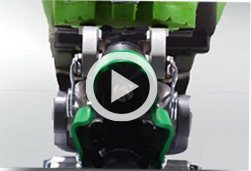 The pivoting toepiece, heel-retention system, and improved binding elasticity were among a number of technologies patented during the creation of the Beast. The standard, Tech-compatible (TLT) boot is going to need an upgrade. The Beast 16 uses a new four-point heel retention system which requires a Dynafit Power Insert be added to the boot. This metal insert slips onto the heel bail of the boot, screws into place, and gives you a more secure and responsive boot-to-binding connection—now you’re just going to need bigger mountains. The Beast 16 binding is a rarity, pure and simple. Only small number of the limited quantity, limited-edition Beast binding will be made available here in the United States for the 2013/14 season—a handful of which will be available only at backcountry.com. 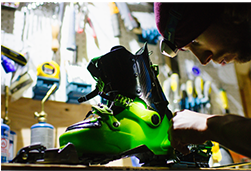 We had to go to great lengths to create a unique boot, binding, and ski-buying experience so we could offer the Beast 16 online—and we were happy to do it just for you. Each set of Beast bindings is individually numbered and marked with a limited-edition graphic. As an added touch, Dynafit had the Beast logo stamped into heelpiece’s metal housing. This could be your only chance to own this version of the Beast, because there’s no telling what form it will take next year. Be warned, when we say that the Beast is a limited-quantity item, we mean it. Once the Beast sells out, it’s gone until next season. Ask yourself if you can wait 12 months for the Beast to reappear or if you’re ready to step up to bigger mountains and burlier lines right now. Learn about the features that make the Beast 16 unique and why this is Dynafit’s premier big-mountain touring binding. An overview of technical aspects that differentiate the Beast 16 from almost every other Tech or touring binding on the market today. From telemark to touring to alpine, this article outlines and compares three types of ski bindings so you know what to look for when you’re shopping for ski gear. Every Beast binding must be purchased as part of a complete ski, boot, and binding package. To help you get the most out of the Beast 16, our buyers curated a distinct collection of skis and boots that complement the Beast, whether you’re hammering a big-mountain line or tearing into a locals-only powder stash. 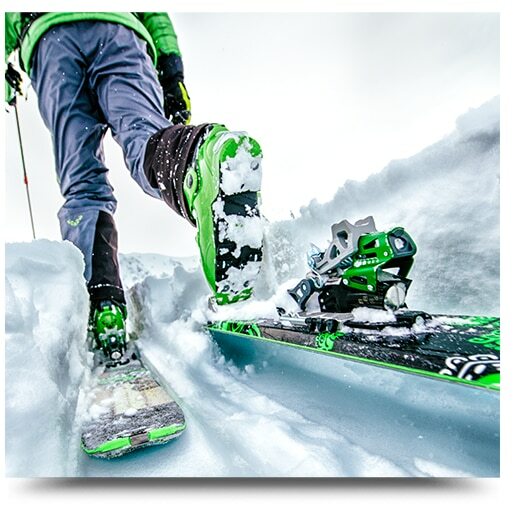 Want to pair the Beast with a ski or boot you don’t see here or on the Configurator page? Call 1-855-485-8180 to get in touch with our knowledgeable customer service representatives and learn more about buying a custom package. technical specs that pop up, and then click on the ‘Start Configurator’ button below. The Beast 16 Binding isn’t here yet, but it will be soon. Enter your email and we’ll notify you when the Beast lands at our warehouse.